Heat oven to 400°F. In food processor, place olives, garlic, capers, parsley and oregano. Cover; process with on-and-off pulses until coarsely chopped. With food processor running, pour oil through feed tube; process until well blended. Spray large cookie sheet with Crisco® Original No-Stick Cooking Spray. Unroll pizza crust dough on cookie sheet; press into 15x10-inch rectangle. Bake 7 minutes or until light golden brown. 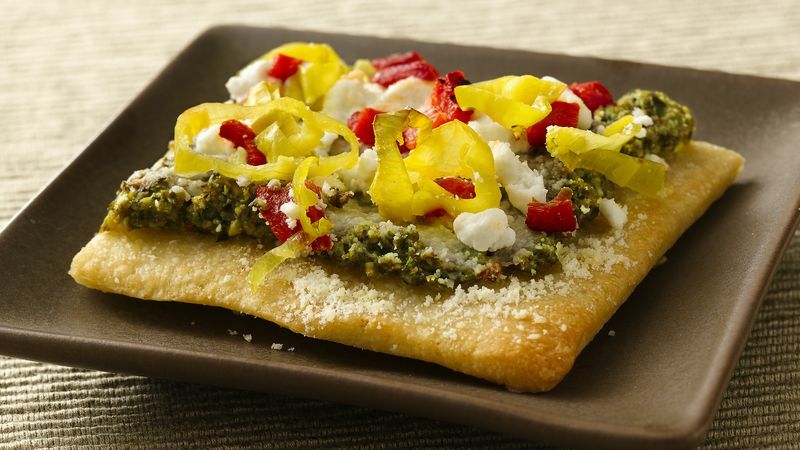 Spread olive tapenade over partially baked crust. Top evenly with cheeses, red peppers and pepperocini peppers. Bake 8 to 11 minutes longer or until golden brown. Cut into 24 squares. Serve warm or cool.